Can anyone recognize these wheels? - Miata Turbo Forum - Boost cars, acquire cats. Can anyone recognize these wheels? Says they're rotas, but I can't find the rim. I kinda just want to see the weight and whatnot of the rim before I go check them out. 15x6.5. And for a second question if anyone reads this, what's the best "budget" sub 100$ tire for that size wheel. I'm thinking in the 205/50r15. He's basically letting these wheels go for free, but it's a bit of a drive. That is a copy of an old 5-Zigen design. From the multi pattern (4x100/4x114.3) drilling you know they are copies. About 10 years ago that was one of the most copied wheels in the tuner wheel market. Could be any one of literally 20 different brands. But yes, 205/50 will work on an NA/NB Miata. Unless you are paying less than $200/set delivered for those though, I'd pass. There are cheap 15x8's now you can find for <$400 shipped, the best ones like our 6UL, are about $670 shipped. 205/50's work best on 15x8's. Enough better that waiting until you can afford the right wheel for the tire will be what most people on this board will recommend. I have the guy at 140 with the tires, but they only have a solid 4 months left on them. Considering the car is a street only car atm and won't see track days for months to come I guess it's not that bad of a deal just to get off the stockers? Not to mention I just graduated high school and will be going to college here in a bit so I'm not necessarily looking to spend that much on wheels (even though I'd love a set of 6ULs or RPFs). How do you know how much time is on the tires as though it doesn't matter if you actually drive or stop on them. If they are sitting and only have 4 months on them, you probably have some rotted *** tires and shouldn't be buying them for the tires themselves and replace them immediately then set fire to them and buy junky *** TRM's with semi decent tires. 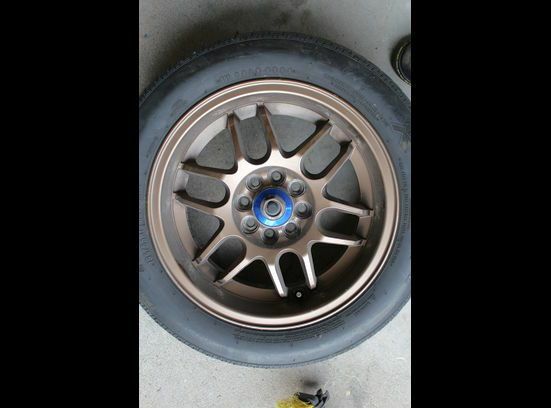 Quick Reply: Can anyone recognize these wheels?